Does God Serve You? : My God is Emotional; Sorry About Yours. My God is Emotional; Sorry About Yours. I was listening to a local Christian Radio station today, instead of my normal sports talk, because I really want to make an effort to figure out why everyone is always talking about how awesome modern Christian music is and how good it is for you; and how much God likes it. You see, I am pretty much tone deaf, due to my brain injury, and I get sick listening to most music, especially if the bass is heavy or its harmony is in need of help. I frequently have to leave for the first 20 minutes of church, for example, because my church has invested in LOUD and respects the need for bass. I'm from the Beatles generation and I remember the Stones when they were young, so its not that I don't like rock; its that I can't deal with music that is not really music. Worse, have you really listened to modern Christian Music? Some of it does not even make sense. It is either humanistic rather than biblical, or just the same thing, said over and over again. Yet, my whole church thinks it is necessary, even to the point of being one of the fruits it seems, and my wife and daughter like it, so I wanted to give it a shot. I turned the station to Christian, and it was ok. I droned the stuff I understood. I listened to make sure it was actually biblical, and I was starting to get into it. Then, the D.J. came on and said something else that sounded really good. Covered all the bases. Didn't go against common sense and made God sound like he was really awesome and someone I wanted to know. I was digging it. Wow, this station had really changed. She was extolling the virtues of a relationship with Jesus, and how he could bring peace into your life. I need peace, so I was listening. She then cautioned us that he would not change our circumstances, but would change how we looked at them, and that would bring us peace. That sounded like a rational approach to prevent another common thought in the Church today that I call "God is a Genie." In fact, this "will not change your circumstances" attitude is so popular now I have heard it in the halls of church and I think I heard it from the pulpit. It fits in with what we hear from today's psychologist as well. You can't expect God to change your circumstances, the theory goes. That's up to you. Be calm. Accept life as it is. Change your attitude and you will live longer. It is what it is. You don't have to take everything emotionally. It's not personal. Approach it with logic and the scientific method. Wait a freaking minute. When God asked Abraham to sacrifice his son, that was PERSONAL and EMOTIONAL. But back up a second. It also had the chance of ending a very large CHANGE to Abraham's circumstances. He was old. His wife was old. Way to old to have children, and she was barren. Yet, GOD CHANGED THAT. He did have a son. Now he was supposed to kill him. What about Moses. One minute he was a prince of Egypt, the next minute a fugitive. That's pretty bad stuff. How do you come back from killing the most powerful king in the world's soldiers? You don't. You run away. Moses did that. Yet, God CHANGED THAT TOO. Moses becomes one of the greatest leaders in the world. It was VERY PERSONAL and VERY EMOTIONAL for him too. So much so, God had to give him a helper just to do it. What about Peter? He was an uneducated fishermen in the poorest part of the middle east. Three years latter he is the leader of the largest religious movement the world has ever seen. That's a pretty big change in circumstances. What about Joseph? He was being killed by his brothers. God steps in and CHANGES EVER THING. The next thing you know, he is as powerful as the king of Egypt, and actually running the country for the king. Remember how he felt when he was reunited with his family? VERY EMOTIONAL. VERY PERSONAL. But that's just us. Surely God is not EMOTIONAL or PERSONAL, right? We are made in his image, so this is an important question. Fortunately, it is also a simple one. God is LOVE. That's emotional. And, God hates. God can be happy and angry too. 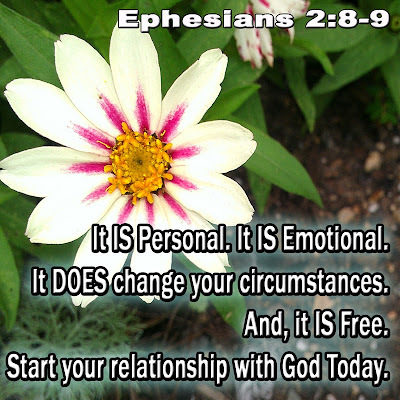 GOD IS EMOTIONAL, that is one of the gifts we were given from God. Plus, he wants a personal relationship with you, so much so, that it is free. No matter how bad you have been. No matter what you have done. He still wants a relationship with YOU. Amazing. Amazing Grace. So, don't buy into the logic and philosophy of the world. Even if you hear it at church. Even if you hear it on the Christian Radio. God is AWESOME, as in LARGE and POWERFUL, and the entire history of his relationship with his human creations, the whole of the bible, is example after example of God changing circumstance of his people. And don't be ashamed of your emotion. And NEVER think that it is not personal. 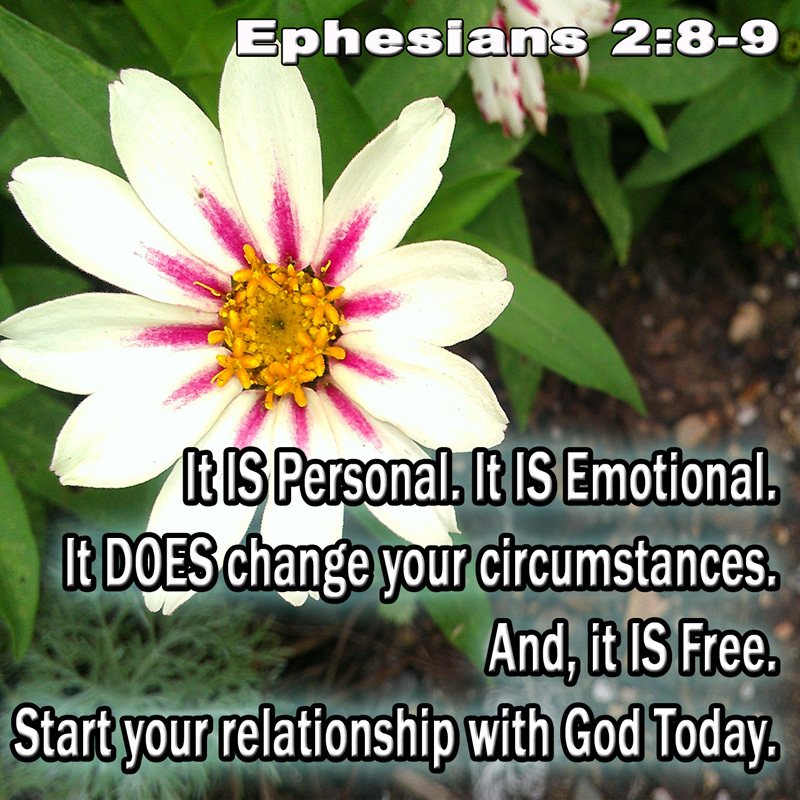 He wants a PERSONAL relationship with YOU. We can't know his will with certainty We can only read the bible, listen for the spirit, get advise from our Christian friends, pray, and walk our walk the best we can. God is there, and he is not just watching. He can and does change things. You can NOT invoke him, because he is not a genie, but you can beg, plead and expect it to work out. That's called faith. Why should you have faith that it will work out? Because he said it does. All things work together, we are told ,for those who love the Lord, and are called, according to his purpose. You have been called. He will make it work. It will be emotional, if you allow it to be; if you live it out loud. It will be personal. God is God. Ephesians 2:8-9 - (NIV) - "For it is by grace you have been saved, through faith—and this is not from yourselves, it is the gift of God, not by works, so that no one can boast."